MC28 and MC34/36 sailing in heavy wind. These two photos show Vagamundo, a Multichine 28, and Arakaé, a Multichine 34/36, sailing in heavy wind conditions. The first boat is sailing in the South Atlantic, while Arakaé crosses the fresh waters of Itaipu lake, the larger artificial reservoir in the world, placed in the Parana River, between Brazil and Paraguay. 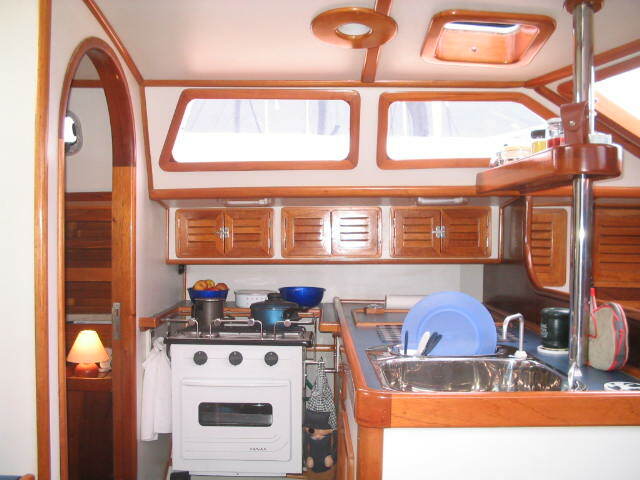 These two boats, besides the fact that both are very well built, they also arise a special curiosity on us for their owners intended cruising plans, Vagamundo with an ambitious cruising schedule to sail abroad, and Arakaé's skipper intended voyage down the Parana River until reaching the River Plate, and then sailing back to Brazil till the port of Paranagua. Arakaé is the first boat that large designed by us to be sailing in that fresh water dam as large as an inland sea. Three years and six months of building, plus two years in preparation, and my Blue Serenade is lying placidly in Salvador, after sailing for one thousand miles along the eastern coast of South America. Serenata took part in the 'Cruzeiro da Costa Leste Rally', when she had the chance to prove how fast and safe she is. I would like to share with you, my friends from Roberto Barros Yacht design, my overflowing happiness. Attached are some photos of Serenata. They tell a lot more by themselves than one thousand words. Marcelo Brasil. Serenata is a Multichine 36 steel yacht. 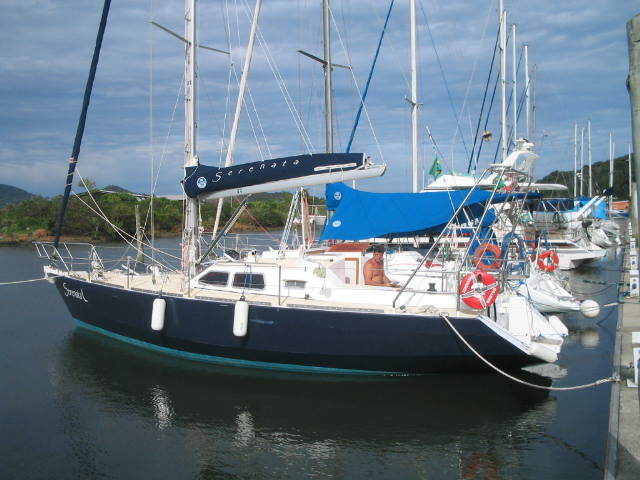 The Multichine 34/36 Arakaé built at Foz do Iguaçu, State of Paraná, Southern Brazil by her owner, Pedro Tremea, is ready to be launched. 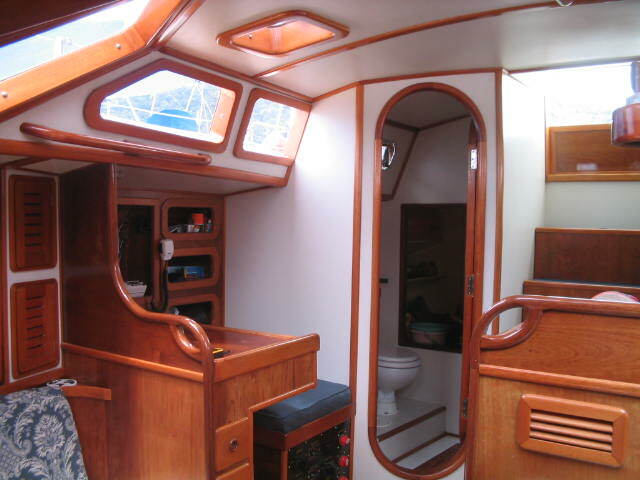 Arakaé was built with the assistance of professionals who hadn’t any previous experience in the boat building trade. 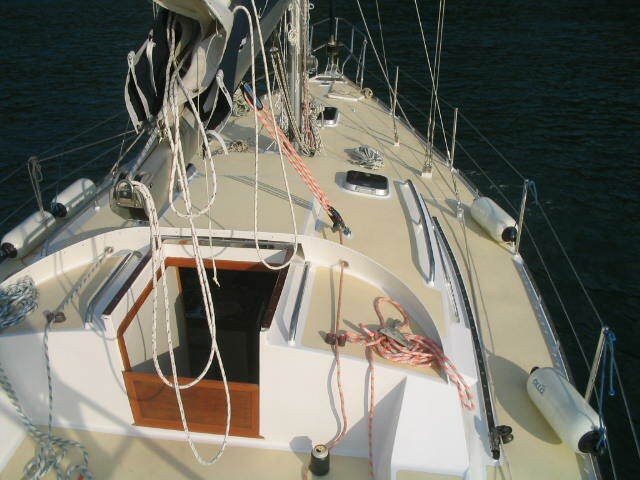 The general standard of the construction of Arakaé surpassed by far the quality of many series production cruising sail boats, becoming a good example of custom construction potentiality. Pedro intends to launch his boat in the artificial lake of Iguaçu, the largest hydro-electric power station in the world. 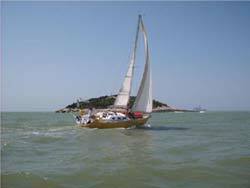 After enjoying for a while the touristic attractions of this immense continental man-made sea, Pedro will sail her downstream rio Parana, until reaching the River Plate, where Arakaé will be introduced to the salt waters of the Atlantic Ocean. 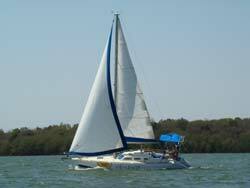 From there she will sail north, until reaching Paranagua, her future home port. Arakaé’s furniture is so well finished that these captions of her joinerwork are worth being published. 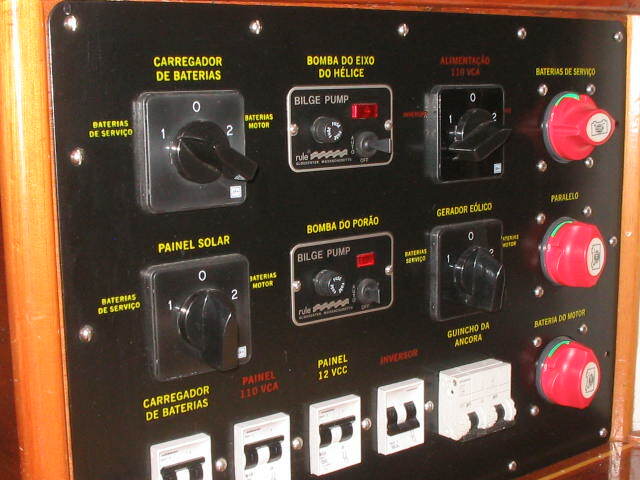 Last Saturday I felt a relief in my anxiety, when visiting José Oscar Bentini´s boatyard to look at the Multichine 34 Serenata under construction there. I discovered that the boat is in a much more advanced stage of progress than I expected. Seeing the boat nearly completed was reason for a great joy. I was looking for a smaller boat here and there, when the solution for my problems was so close to me. You were really inspired by Neptune when conceiving this new design. The germans called the DKW car model, "Das Kind Wonder". I guess from now on Ill call the M34, as DKW34. I intend to build her in ply-glass in the near future. Meanwhile I would love to make a model in a small scale. Frankly I'm good at that. Congratulations for the design, and my special thanks to your wife Eileen for the kind way she received me. Dr.William B. Lee is a famous yachtsman, internationally known for the design, building and ten years of living aboard the junk-rigged 30m schooner Lady Lee. 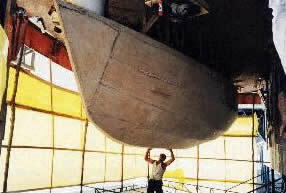 Now he is intending to build a smaller boat that will give him more freedom to sail short handed. 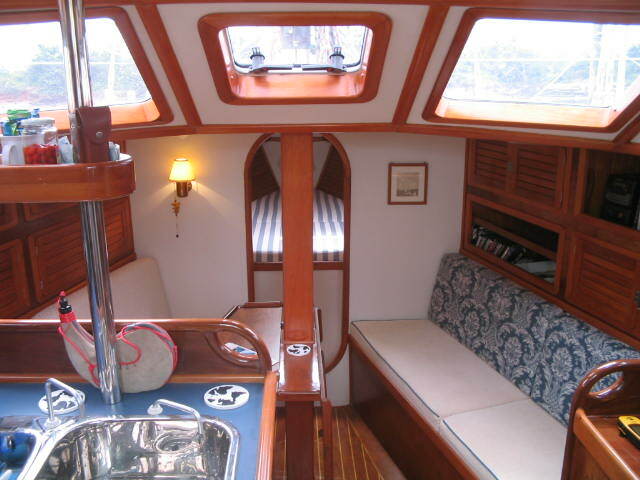 Those who visited Serenata always ask if you from the design office have yet the chance of paying a visit to this charming boat. 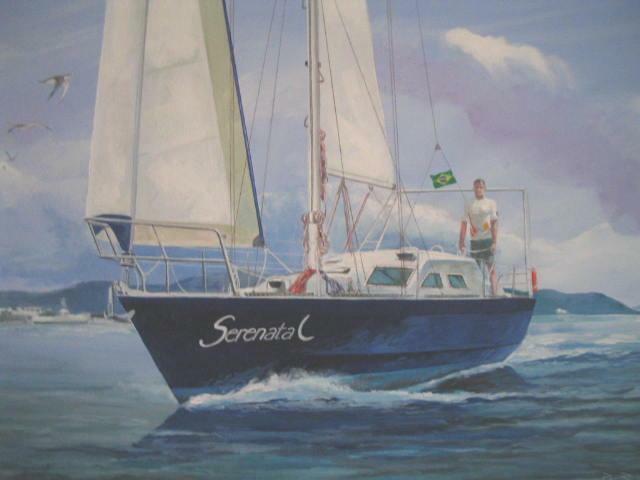 I am taking this opportunity to inform you that Serenata is as good as any series fibreglass boat, and is faster than bad news, which was a great surprise among our sailing community, including myself. Considering its steel hull, it couldn't sail faster... Seven knots is her average speed. My former yacht, a 32 foot production yacht, seldom reached that speed. Two weeks ago we were caught by a tropical storm, 20 miles offshore, the wind blowing at 50 knots with totally white seas, and waves growing in size at an astonishing rate. That wind caused havoc in Ilha Bela, the closest land from where we were sailing, destroying boats and causing serious damage ashore. Serenata coped with those conditions hardly taking notice of the bad weather, with perfect stability and absolute control. 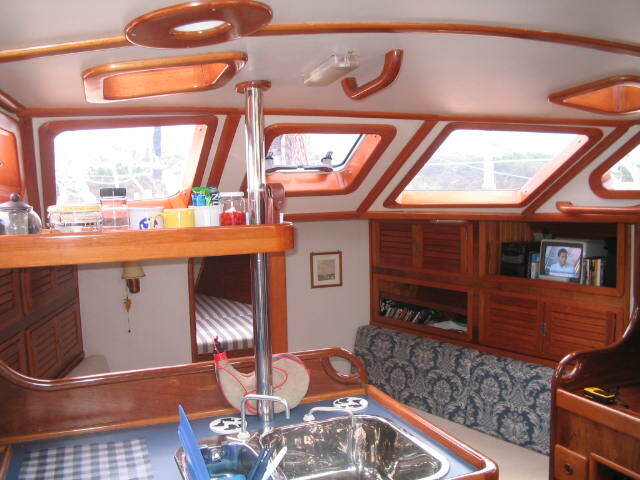 Who said ply-glass boats aren`t light enough? Dannubio Semeraro doesn`t think so. Look at him holding his just completed hull after one month work. Guiness Book of Records should keep an eye on him. This is a Multichine 34 being built by an Amateur.